Recently the Centers for Medicare & Medicaid Services (CMS) issued a final rule to ensure that Medicaid’s home and community-based services (HCBS) programs provide full access to the benefits of community living and offer services in the most integrated settings. Under the final rule, Medicaid programs must support home and community-based settings that serve as an alternative to institutional care and that take into account the quality of an individual’s experience. The final rule includes a transitional period for states to ensure that their programs meet the new requirements. More than two-thirds of Medicaid long-term care dollars are spent on institutional care (including nursing homes). Medicaid HCBS Waivers may help prevent or postpone the institutionalization of individuals who could be served just as effectively within the community and could, as a result, save money. To receive approval to implement an HCBS waiver program, state Medicaid agencies must ensure that the cost of providing home and community-based services will not exceed the cost of care for the identical population in an institution. Just before this CMS ruling was released, the Alzheimer’s Association was invited to make a presentation at the Hawaii HCBS Conference about the role that Alzheimer’s Disease State Plans play in expanding home and community-based services. The conference was hosted by the Hawaii Executive Office on Aging and the National Association of States United for Aging and Disabilities (NASUAD). A majority of states with published Alzheimer’s Disease State Plans have included recommendations to improve services provided in the home and community to delay and decrease the need for institutionalized care. 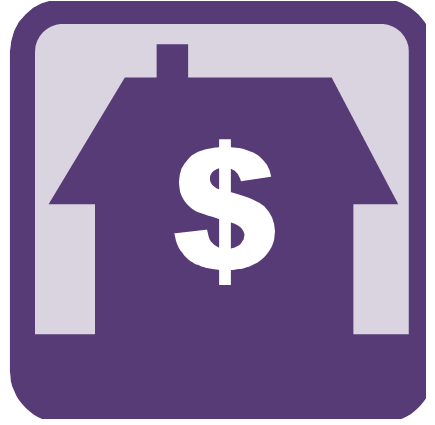 Individuals who are in the early stages of Alzheimer’s generally prefer to live at home, and with the high costs of institutionalized care, it is becoming increasingly clear that aging in place is more cost effective. A Medicaid-financed nursing facility averages $66,000 per year and a private-pay nursing facility averages $81,000 per year, whereas, home and community-based services average $24,000 per year. States and communities around the country are hard at work sharing and implementing the actions of The Healthy Brain Initiative: The Public Health Road Map for State and National Partnerships, 2013-2018. 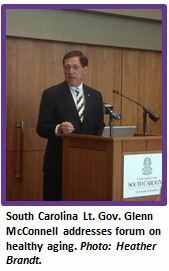 In December, the University of South Carolina sponsored, “Healthy Aging: A Focus on Cognition,” with speakers from the local Alzheimer’s Association Chapter, researchers from the Arnold School of Public Health, and Lieutenant Governor Glenn McConnell. The latest data from the South Carolina Behavioral Risk Factor Surveillance System (BRFSS) was shared along with the Road Map. New York’s Commissioner of Health, Nirav R. Shah, M.D., M.P.H, sent a “Dear Colleague” letter in November to hospitals, clinics, medical schools, managed care plans, and practice groups, promoting the importance of early detection of Alzheimer’s disease and urging practitioners to learn more about validated cognitive assessment tools. The Minnesota/North Dakota Chapter of the Alzheimer’s Association convened a meeting of public health, aging, academic and foundation leaders from Minnesota to discuss implementing the Road Map. The half-day session produced a set of priorities for addressing Alzheimer’s disease in the state. The Road Map serves as an important tool to aid state officials in their efforts to ensure that states are dementia-capable. 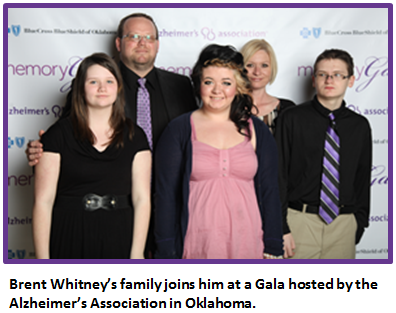 Since he was diagnosed with a gene mutation, N1411, which plagues most of his extended family, Brent Whitney has joined forces with the Alzheimer’s Association’s Oklahoma Chapter to advocate for increased research, care and support. Doctors say Brent will develop Alzheimer’s around age 50, the same time his father did. Brent is currently 34 years old. Brent’s grandmother carried this gene mutation and nine of her 14 siblings died around age 55 from younger onset Alzheimer’s. Among his grandmother's and her siblings’ 36 children, 25 are at risk for carrying the gene mutation. So far, five of those children, including Brent’s dad, have died in their 50s or 60s. Brent is one of 87 grandchildren, 44 of whom are at risk. Since learning of his increased risk and seeing the impact Alzheimer’s has had on his family, Brent, his wife, and their children have been outspoken about the disease - its stresses and strains on a family, and the hope that increased research will lead to a cure. Brent has committed to sharing his story with lawmakers and researchers alike with the hope that Oklahoma will continue to work toward becoming a dementia-capable state and that eventually, there will be prevention and treatment protocols in place so that his children will not have to live with the fear of Alzheimer’s. The Alzheimer’s Association calls on state policymakers to focus on four key policy priorities: State Alzheimer’s Plans, UAGPPJA, dementia training, and data collection. To learn more about state legislation we support, click on the brochure at the left or visit our website. March 17th: Minnesota State Advocacy Day in St. Paul. Contact: Jan Mueller, jmueller@alz.org. March 19th: Tennessee State Advocacy Day in Nashville. Contact: Amy French, afrench@alz.org. March 19th: Connecticut State Advocacy Day in Hartford. Contact: Laurie Julian, ljulian@alz.org. March 25th: Iowa State Advocacy Day in Des Moines. Contact: Robyn Mills, rmills@alz.org. March 26th: Colorado State Advocacy Day in Denver. Contact: Linda Mitchell, lmitchel@alz.org. March 26th: Mississippi State Advocacy Day in Jackson. Contact: Patty Dunn, pdunn@alz.org. March 27th: Michigan State Advocacy Day in Lansing. Contact: Lindsay Bacon, lbacon@alz.org. April 2nd: Delaware State Advocacy Day in Dover. Contact: Katie Macklin, kmacklin@alz.org. April 2nd: Illinois State Advocacy Day in Springfield. Contact: Jennifer Belkov, jbelkov@alz.org. April 2nd: Ohio State Advocacy Day in Columbus. Contact: Pam Schuellerman, pschuell@alz.org. April 16th: Rhode Island State Advocacy Day in Providence. Contact: Donna McGowan, dmcgowan@alz.org. April 22nd: Massachusetts State Advocacy Day in Boston. Contact: Jennifer Carter, jcarter@alz.org. April 23rd: Louisiana State Advocacy Day in Baton Rouge. Contact: Knesha Rose, krose@alz.org. April 29th: Vermont State Advocacy Day in Montpelier. Contact: Martha Richardson, mrichardson1@alz.org. May 21st: North Carolina State Advocacy Day in Raleigh. Contact: Scott Herrick, sherrick@alz.org. Council of State Government’s (CSG) Knowledge Center on Dementia. National Conference of State Legislatures’ (NCSL) Alzheimer’s Disease Resource Center. For more information on the Alzheimer’s Association’s state efforts, state policy agenda, or Alzheimer’s disease in general, contact Randi Chapman at rchapman@alz.org.